RIVAL Wealth take a unique approach to financial advice, solving problems for clients through insurance, investments, lending, and KiwiSaver. 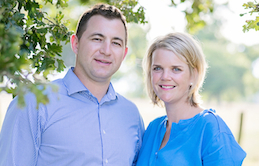 Founders Tim and Carissa Fairbrother opened their doors offering financial advice to the Wairarapa during the Global Financial Crisis in 2008, and have had persistent growth despite a difficult economic environment early on. They now have a portfolio of 2,500 clients nationwide. In 2015 they were granted a Discretionary Investment Management Service licence by the Financial Markets Authority – a huge achievement given only 51 companies in New Zealand offer this service. RIVAL Wealth have a very clear vision for sustained expansion. They are in the process of extending their premises to accommodate their rapidly growing business, and continue striving to help New Zealand become financially organised. Original generation time 3.8908 seconds. Cache Loaded in: 0.0294 seconds.